It’s always nice when one of the most respected institutions in the world provides some research that’s right up your alley. One of the most astounding facts neuroscience researchers have discovered in the past 20 years is that our brains are far more social than originally thought. Our brains are actually wired to connect with each other, like neural wifis. This ability to connect with each other has been and will always continue to be beneficial to human success and well being. 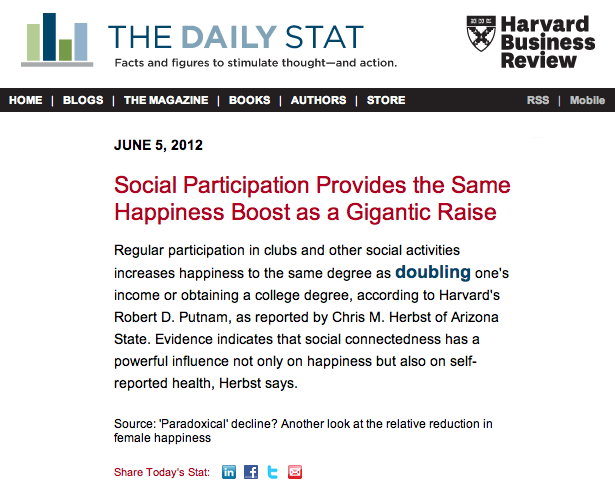 It’s no coincidence social participation can increase a person’s happiness. Over thousands, even millions of years, humans and our apelike ancestors that contributed to our evolution survived and thrived because of our intelligence and high level social behavior. Today, mobile technology and social media monopolize our mental energy. Although our tools provide us with a technological advantage, we must avoid falling into a social deficit. Children, teens, adults, and professionals must place a premium on quality, in-person social interactions that are free from technological distractions. These quality, in-person social interactions will provide our brains the neural pathways for us benefit and get a sense of happiness from being a social participant.